The avuncular Hans Rosling joins us again to explain where the focus on child mortality ought to be placed across the world’s 7 billion people, and whether tackling this issue will make a difference. In his idiosyncratic way to craft a story that is as simple as it is engaging, he presents one of the most pressing and complex problems very clearly. His message: Yes, there is hope for the future! We can make a difference in this lifetime to child mortality. He does leave us with one request: change your thinking. Stop thinking about developed and developing countries, because it is unhelpful in focusing on those people where the real need is found. Good message to reflect on next time you go to grab a coffee mug: we can make a difference. 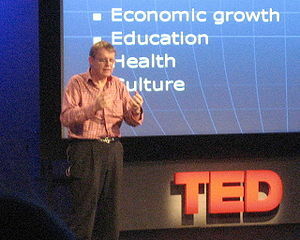 This entry was posted in Child mortality, Hans Rosling, Inspiration and tagged Child mortality, Developing country, Hans Rosling. From child mortality to child survival: what’s in a name?